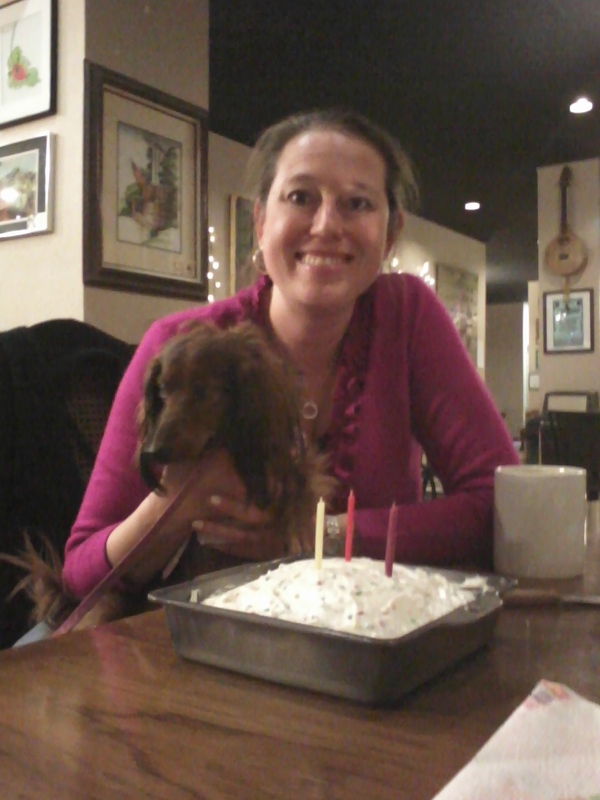 This is an obvious way to love your dog by hosting a birthday party just for them. Zoey’s birthday is Dec. 20, and she would like you to put the date in your calendar. There are many places to get ideas for loving your dog. Shelley, my BFF, is writing about where to find story ideas. Yeah, whatever. She only needs to know where to find me – at her apartment eagerly awaiting her return whenever she leaves. Or when she’s here, well, I’m where there is a loud bark or a quiet sigh as I think about my day. Mark all animal- and dog-related holidays on your calendar, and celebrate those holidays with kisses and treats. Take us on walks every day. Give us treats, lots of them. Buy us cute outfits, so that we get attention. Give us opportunities to socialize, because we don’t want to sit around and do nothing. Pet us, a lot, because touch is important. 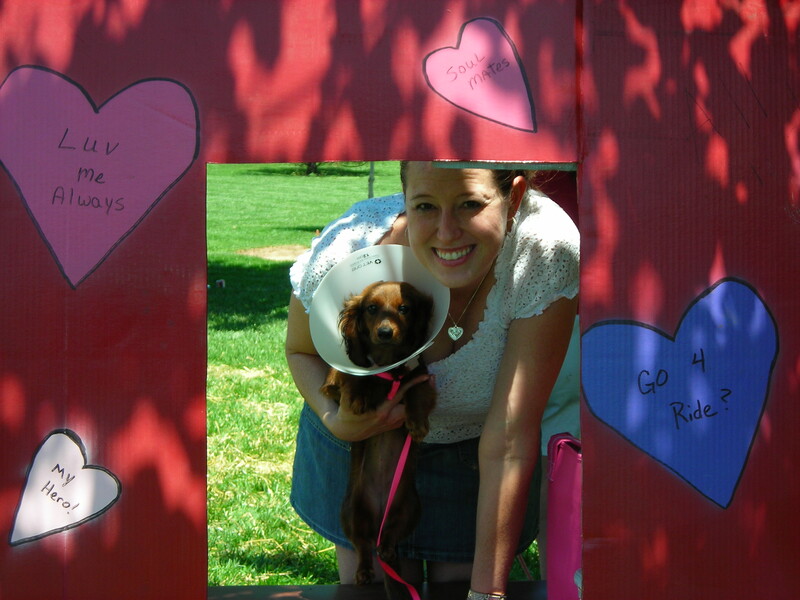 Make a big poster that says, “I Love My Dog” and hang it in a prominent place, both in our home and your office. Take us to the office and tell your co-workers that we’re dog-terns. Love us, unconditionally, even when we’re naughty. Being naughty is part of the fun of being alive, right? And last, but not least, tell us you love us every single day. Inspiration is a two-sided doggie biscuit. On the one side, cute dogs like me inspire admiration. And on the other, I get inspired by being told I’m cute. Either way, I tally up my cute score to be 100 plus points, the highest score possible given that I’m already the CEO of cuteness. To see specifically what dog inspiration means, check out the photos below, some of which include members of my fan club. Zoey is posing with her BFF Shelley. Zoey’s BFF, Shelley, obviously adores her because she is so, so cute! 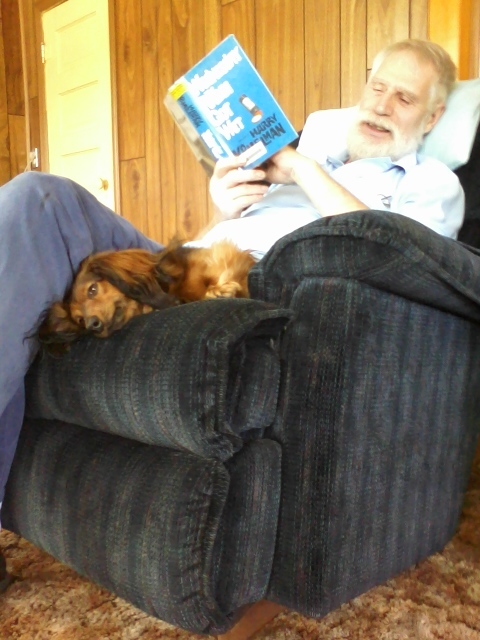 Zoey is cuddling with her grandpa. 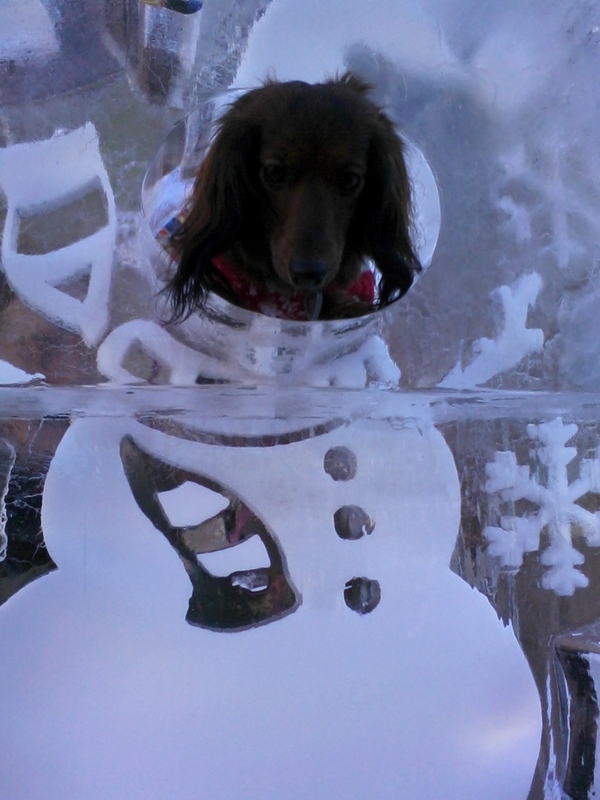 Zoey’s cuteness factor is framed in this snow sculpture. I do not get cute block, as in the dog form of writer’s block. Writer’s block is what writers like Shelley (my BFF) get when they try writing about cats. It’s pretty obvious, because there’s not a whole lot to say about cats – they like mice, birds and chasing things. I’m not ripping on cats, however, because I can admit they are clever, fast and smooth. What I mean is that pretty much all cats like a very small list of boring things – just check out the toy aisle at a pet store. And then go to the doggie toy aisle – there’s more variety from stuffed, rawhide and nyla bones to stuffed animals, balls of all sizes and things to tug. Cute block is what happens when animals born cute become not so cute, such as a porcupine. They are born tiny and cuddly, and then they get very prickly. Or a raccoon with cute eye rings becomes old looking with its big back hump. I remain cute at all hours of the day whether I’m sleeping or awake, whether I’m barking or yawning or sneezing or eating or playing. I’m cute when I tilt my head and widen my eyes, trying to figure out what you’re telling me. I get it when you say I’m cute. What I don’t understand, or choose not to, is when you tell me I’m a bad girl. I am a dog angel with black markings where there should be wings. That means you cannot call me bad, naughty or onery. My mind is blocked to all negative references to my being, my looks and my behavior – as long as I am in the belief that I am not naughty. I am not being bad when I bark at the big dogs. It’s my job as the cutest dachshund this side of the Mississippi to alert the other dogs that here I am. 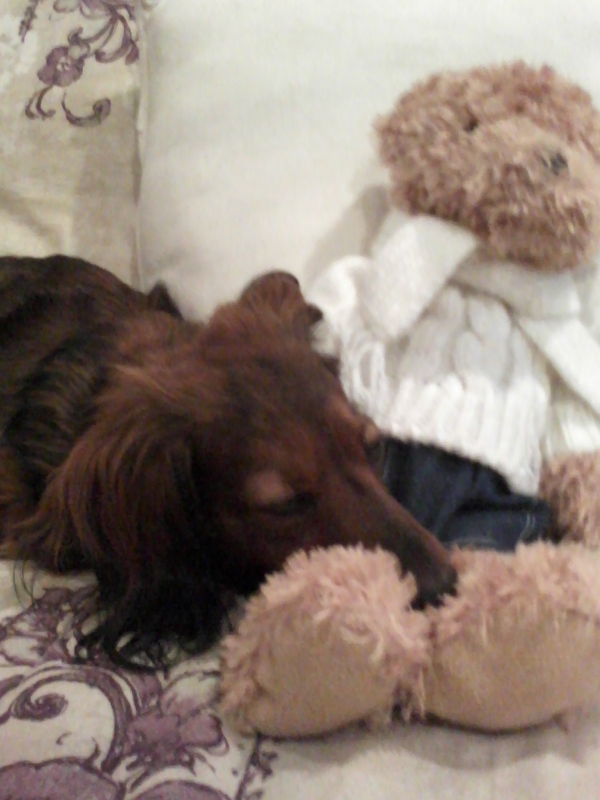 Zoey the Cute Dachshund takes a nap with Shelley’s teddy bear. I do not need revision. 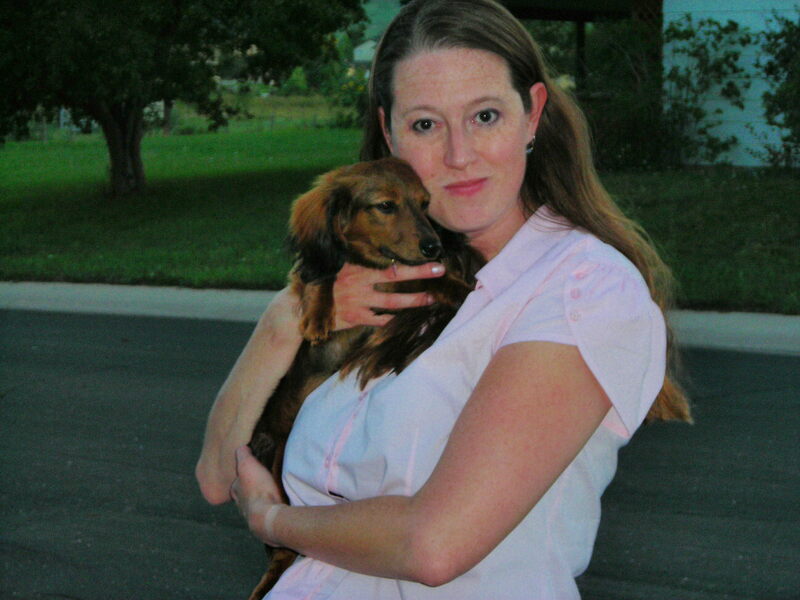 Let me repeat, as the cutest dachshund this side of the Mississippi, I do not need to be altered, changed or embellished in any way. My BFF Shelley, a very keen writer, is writing about revision this week, which I think is a silly topic. If you come out cute the first time, what do you need to change? She says that when revising writing, ask if there any boring parts or parts that are over-explained. Are there parts that are exciting, but feel too rushed? The boring parts are when Shelley leaves me at home to go to work or out with her friends, excluding me from her fun. The only explanation that is needed is that she’s being unfair, very, very unfair. As for the exciting parts, that’s when I’m playing, eating or running. I need an audience to watch me eat (the food tastes better that way). I need sounds or the sight of a bird or cat or a dog’s bark for me to run, or a ball or a toy to chase. And as for playing, I don’t do well hanging out by myself. How do you play tug-of-war when it’s just you at one end of the rope? Or how do you play fetch when no one throws the ball? Or what about chase, you’d be silly running from nothingness. Writers doing their revising stuff often check to see if their characters are well-developed and seem real, not two-dimensional. I am very real (and cute, too), as you can see in this photo. The photo was professionally taken and does not need any touching up. But that’s obvious, because look at the subject of the above photo.